HOTEL ANWAR-E-MADINA . It is the exact spot where the well of Dharwan was situated. It was rthe well uder which a man named '' Lubaid bin assam '' put 11 knotted hairs of prophet Muhammad sallalaa ho allihi wasalam and did magic over beloved prophet sallallaho allihi wasalam and he started to live serious ill . one night in the holy dream angels informed prophet MUHAM,MAD SALLALLA HO ALLIHI WASALAM the location of Dhrwan well and the whole story of magic. prophet sallallaho allihi wasalam recovered this 11 knotted bunch of holy hairs and recited 11 ayats of surah FLAQ and surah NAS and untied every knot on every ayat. And in this way by the blessings of Almighty Allah Prophet Muhammad sallalla ho allihi wasalam Alhamdollillah recovered from such illness completely .In the end prophet Muhammad sallalla ho allihi wasalam refilled and levelled this well of Dharwan . 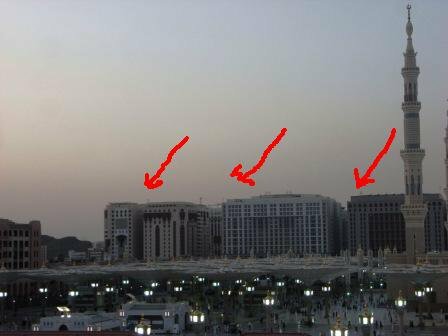 Now the hotel ''Anwar -e- madina '' is there.